Gilford and Conant both came in to Saturday's game with perfect 21-0 records - something had to give. One team was going to have an undefeated championship season, and the other would have to settle for second place. Conant led throughout the game. They were up by double digits for most of the way, and really broke the game open in the 4th quarter en route to a 55-33 win. Senior shooting guard Katie Chadbourne (game-high 14 points) hit a pair of big 3's in the 2nd half, freshman point guard Eva Hodgson (13 points) also hit a clutch 3 as well as an and-1 finish in transition and junior guard Madison Springfield went coast-to-coast for a tough finish through contact that put the game (and championship) on ice. "This was the biggest team win of the season" said Springfield, a Holy Cross recruit. "I couldn't be prouder, especially to go undefeated. It's indescribable right now. I love these girls so much." Conant High girls basketball has now won 4 titles in the last 11 years. The school's boys basketball team has won 7 titles in the past 9 years. No other school in the state has basketball programs that are as consistently strong on both the girls and boys side as Conant. "It feels amazing" said Hodgson, who also had 7 rebounds, 4 assists and 4 steals in addition to her 13 points. "Coach kept pushing us in practice, and all of our hard work paid off. We have different types of players. Maddy is a great all around player, we have Sarah (Gonsalves) in the paint, Katie is a good shooter. The pieces fit together." 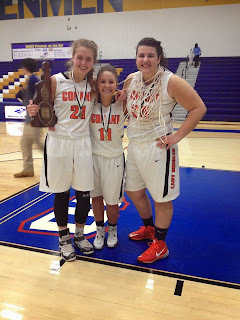 Conant has been led all season by Springfield - the best player in the NHIAA. Springfield was sensational in the Orioles' semi-final win over Pelham, dropping 29 points. In Saturday's final vs. Gilford though she shot just 1/11 from the floor and had 5 turnovers. "It wasn't my best game, but my teammates stepped up" said Springfield. "They had my back." "Her teammates picked her up" said Conant High head coach David Springfield, who is also Madison's father. "This is a true team." This marks the fourth time in the past 3 years that a father has coached his daughter to a state championship in girls basketball. The other 3 were Merrimack Valley (head coach Dave Huckins and daughter Cassidy) and Hinsdale (head coach Terry Bonnette and daughter Skylar) which were both last season and 2 years ago it was Lebanon (head coach Tim Kehoe and daughter Emily). David Springfield also coached the Conant girls to a state title in 2005. Madison Springfield and Eva Hodgson follow in the footsteps of their siblings (Brooke and Devin Springfield, and Ezra and Eli Hodgson) who all won state titles at Conant as well. "I remember watching watching Brooke and Devin from the stands" said Springfield with a smile. "It's amazing." Gilford put up a valiant effort. They fought hard and hung with Conant for most of the way. They only trailed 19-13 after 1, and were down 26-20 at halftime. Their half court 1-3-1 zone gave the Orioles problems, as Conant was held scoreless for the final 5 minutes of the 2nd quarter. "A lot of teams in southern New Hampshire rely on man-to-man defense" explained Gilford High head coach Rick Forge. "We had to show them a different wrinkle. Not a lot of teams in southern NH play a 1-3-1." Hodgson dished it inside to Gonsalves for a layup that made it 26-15 Conant with 5:20 left in the 1st half. The Orioles were held scoreless for the rest of the 2nd quarter, as Gilford forward Madison Harris (team-high 10 points and 5 rebounds) showed good effort on a put-back and the Golden Eagles closed the 1st half with 5 unanswered points. Conant struggled to score against the 1-3-1 in the 2nd quarter. "We hadn't seen it before" said Madison Springfield. "We weren't using ball fakes enough." Conant pushed their lead back to double digits early in the 3rd quarter, as they pounded it inside to Gonsalves for a layup and then Springfield ripped down a defensive rebound and got the ball ahead to sophomore guard Megan Wheeler for a fast-break layup. That made it 31-20 Orioles with 6:40 left in the 3rd quarter, forcing Gilford to call a timeout and sending the Conant faithful into a frenzy. "It was our gameplan to get the ball to Sarah" said Coach Springfield. "We thought she had a mismatch inside. She played a great game. Everyone talks about Maddy and Eva, but Katie Chadbourne and Meg Wheeler have hit clutch 3's all year." The boys basketball teams for both schools played in quarterfinal playoff games last night as well. Gilford fell to Pelham, while Conant beat Mascenic in a thriller to advance to the Final Four. That made it 33-24 Orioles with 4:25 left in the 3rd quarter. Hodgson then drilled a 3-pointer from the left wing to extend the lead to 36-24. Harris answered right back on the other end for Gilford with an offensive rebound and put-back. Then it was Chadbourne connecting on a clutch 3 from the left wing against the Gilford zone and it was 39-26 Conant. Nelson stepped in to draw a charge on Springfield, and then Brooke Beaudet made a nice pass to Harris for 2. It was 39-28 Conant after 3 quarters. "They definitely came to play" said Gonsalves, a 6-foot junior forward. "We knew we had to finish our layups, and use everything we had worked for. Tonight everyone had to give 110%. We'll never forget this." Harris converted another put-back early in the 4th quarter, followed by a short jumper by Nelson to cut the Conant lead to 39-32. Gilford's fans were getting loud - they had hope. But from that point Conant outscored them 16-1 over the game's final 6 minutes. Out of a timeout Chadbourne buried a clutch 3 from the right corner. Then after missing her first 10 shots from the floor, Springfield finally found the bottom of the net. She pulled down a rebound, was double teamed in the back court but somehow dribbled through both defenders, slashing through the entire Gilford defense on her way to the rim before hitting a tough leaner through contact. A great play by Springfield, showing skill and determination. The Orioles now led 48-33 and cruised from there for the 55-33 win. Springfield played her freshman season at Conant, leading the Orioles to the semi-finals. Last year she attended Marianapolis Prep before transferring back to Conant this season. "Maddy comes back and Eva comes in as a freshman, so we added probably the best player in the state and one of the best freshmen in the state" said Coach Springfield. "You add 2 players like that, in Division III and people were saying it's all over. hat put a lot of pressure on us. Gilford presented problems, they hit us in the mouth. My hat goes off to them."